Giovanni Solinas under pressure for a win at the MTN8 quarter finals - SABC News - Breaking news, special reports, world, business, sport coverage of all South African current events. Africa's news leader. New Kaizer Chiefs coach, Giovanni Solinas, is under pressure to deliver his first win. 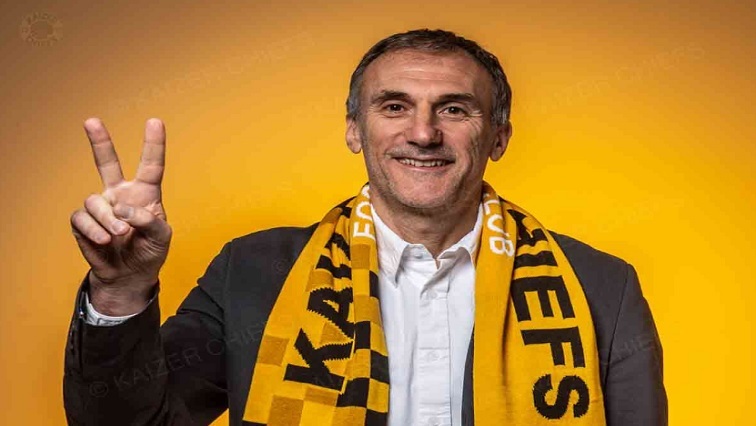 New Kaizer Chiefs coach, Giovanni Solinas, is under pressure to deliver his first win to his employers and the Amakhosi’s faithful. Solinas will face off against his former team, Free State Stars, in the MTN8 quarter final match at the FNB Stadium on Saturday. Orlando Pirates are tipped to be favourites when they take on the unpredictable Super Sport United at the Orlando Stadium. In two ABSA Premiership matches, Kaizer Chiefs have already conceded four goals. It is cause for concern for a team that conceded fewer goals than any other in the PSL, last season. However, Chiefs’ forward Kabelo Mahlasela says anything is possible in cup matches. “We are ready as a club, this one is a cup game it is not a league game whereby you get a second chance or second round. It is a cup game, it is wafa-wafa; if you win this one, you get to qualify for the second round”. It is a work in progress for Pirates in terms of finishing in the goal line. Although rookies Highlands Park dominated the opening match in the Premiership, Pirates missed a lot of opportunities. However, they made up for their mistakes when they beat Chippa United one-nil in the afterward match. Pirates coach Milutin Sredojevic predicts a tough match against Super Sport. “We know that Super Sport has got a history of doing very well in cup competitions, we have been respectful towards them. We are looking at ourselves believing in the work that we do. We are having support from our fans at this important moment; however, we do expect a tough competitive match”. Super Sport United, who are the defending champions, will not be an easy meat for Pirates. New coach Kaitano Tembo says it’s going to be a tough match. “Coming to our game on Saturday, I think this is out third game in seven days and at the moment we don’t really have a very big squad because we are not playing in Africa. It is a moment where we are trying to manage our players so that each and every time we play we have fresh legs on the field, noting that we are playing against a very good team which is Orlando Pirates. They’ve really improved for the past year and playing good football so it is not going to be an easy game for us but at the same time we are the defending champions and we’ve got no choice but to try and defend our cup because we’ve got it”. Another match that will be taking place on Saturday is between Mamelodi Sundowns and Golden Arrows. Then on Sunday, Maritzburg United will take on Cape Town City. This entry was posted on 10 Aug 2018,03:05PM at 3:05 PM and is filed under Sport, Homepage Latest Stories Slider. You can follow any responses to this entry through the RSS 2.0 feed. Both comments and pings are currently closed.